The first Pro Wrestling show I would attend. The first Pro Wrestling show I would attend at Madison Square Garden (in the early 2000s, I attended the FILA World Freestyle Wrestling Championships at MSG) . The first World Wrestling Entertainment show I would attend. To say that I had butterflies in my stomach would be an understatement. But when my friends offered me to attend with them, i definitely could say no. I went to the event with two friends: a female henceforth known as Hobbit and her BigBro. We arrived at 4:47 PM at Madison Square Garden when everyone was scurrying to get in. Security seemed so rushed, they barely checked Hobbit’s bag. Hobbit later remarked that she could have snuck in treats and water. I would reply vodka but she said she prefers tequila. I wouldn’t say we weren’t surprised when we discovered our seats were stools in the back of the balcony area but that’s more of MSG making silly ideas to increase revenue instead of creating a more comfortable experience adding an additional row. The following excerpt is from an interview conducted by MMA Rising’s Robert Sargent and translated by my previous guest, Roxanne Modafferi. UFC Champ Lesnar’s New Old PR Guy Interviewed and MORE~! The Wrestling Observer Online/ Figure 4 Online’s Dave Meltzer and Bryan Alvarez do a Post-UFC 116 interview with UFC World Heavyweight Champion Brock Lesnar’s new old PR manager and official biographer: Paul E “Dangerously” Heyman. They talk about UFC and the state of Pro Wrestling. ROXANNE WINS~! 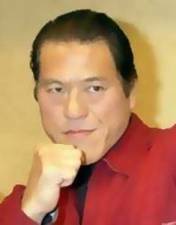 And other King of the Cage “Toryumon” Results featuring MAMORU!! On January 30, 2010, former guest of the show, Roxanne Modafferi added another win to her record. A few weeks back, the King of the Cage (C), American Mixed Martial Arts promotion decided to begin their Asian expansion holding an event they would entitle “Toryumon” at the Okinawa Convention Center in Okinawa, the accredited birthplace of Karate. This reporter does not know if Ultimo Dragon’s copyright extends to the Ryuku Islands or if was expired to begin with. Thus they contacted Roxanne, who recently fought StrikeForce W omen’s Lightweight Title contender Merloes Coenen (!7-4-0) in November 2009 in lL at the “StrikeForce: Fedor vs Rogers” event, to fight Molly Helsel (8-8-1). After some striking exchanges, the fight ended at 3:18 of Round 2 when Roxanne applied an inescapable Rear Naked Choke.